The most fun thing about being a Cord enthusiast is --- guess what! --- meeting other enthusiasts. You meet them all over the country, and all over the world. I've been lucky enough to meet more than my share, including some folks who played major roles in the Cord story. 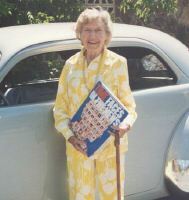 Virginia Cord in 1993 with TIME magazine's collection of cover art. E.L. Cord was on a TIME cover twice. 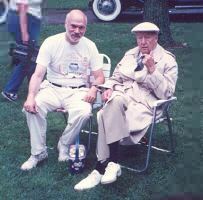 With Gordon Buehrig in Auburn in 1989. 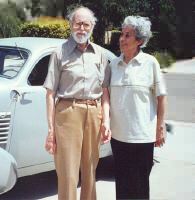 Alex Tremulis and Chrissie, at home in 1990.